The City of San Diego has a new logo. Get ready for everything to be rebranded with the fresh look. 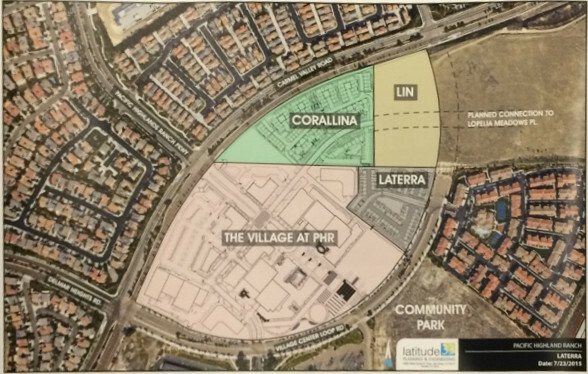 The Carmel Valley Community Planning Board (CVCPB) voted on the One Paseo project at the January 2016 special meeting. The result was split, with 5 FOR the project and 5 AGAINST the project. One Paseo will now move forward to the Planning Commission and the City Council without a formal recommendation from the community, but those groups will likely understand that the project is still contentious within the community. The Planning Commission hearing will likely be in late February or early March. Additional information can be found at the CV Planning Board Page on this site, or on the City's Carmel Valley community planning page. The December 2015 Draft Community Plan Amendment includes the following documents: a Cover Memo (PDF), an updated Carmel Valley Neighborhoods Land Use Map (PDF), a document that shows the Carmel Valley Community Plan text changes (PDF), and the proposed One Paseo Precise Plan Amendment (from December 2015). The Carmel Valley Community Planning Board (CVCPB) will hold a SPECIAL Meeting on Wednesday, January 13, 2016 at 7:00 pm at Cathedral Catholic High School, 5555 Del Mar Heights Road. See the CVCPB Meeting Announcement for details. 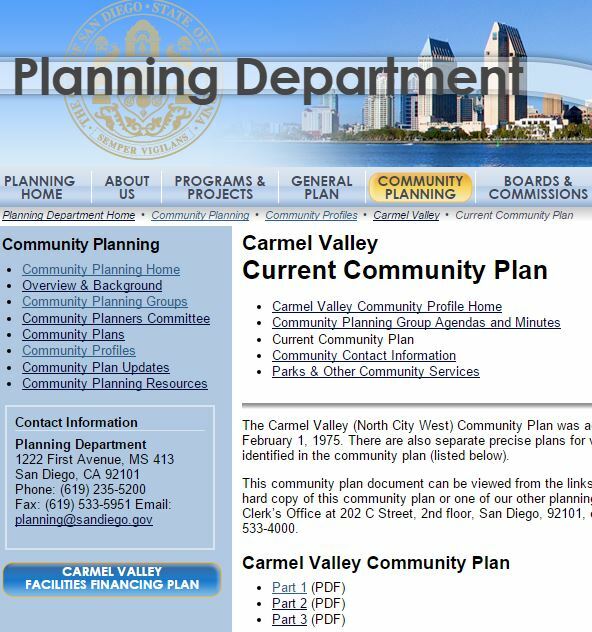 Additional information on the CVCPB can be found at the CV Planning Board Page on this site, or on the City's website at the Carmel Valley, San Diego Community Page. 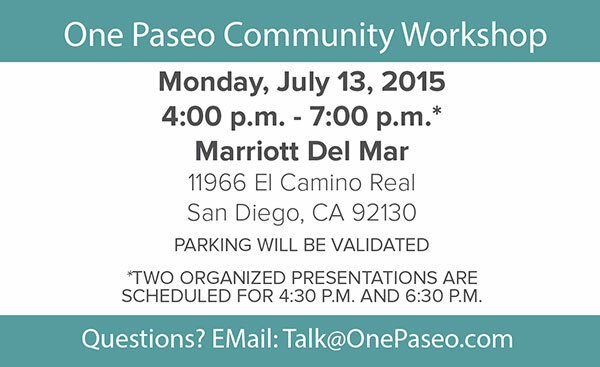 The One Paseo August 19th Workshop information is now available online, as a Virtual Workshop (click here.) You can read through the information and submit your comments now through September 2, 2015. So, if you didn't make the meeting, here is your chance. The online information includes a video of the presentation on the main page, a copy of the presentation (click here) that was given, and a copy of the station boards that were presented at the meeting. The station boards (click here) include three different conceptual plans, all of which are very similar at first glance. The Planning Board would like your input on these plans, and would like to hear what you like (or don't like!) about them. Of course, if you have better ideas about how the project should be organized, please let the board know via drawings or written descriptions. 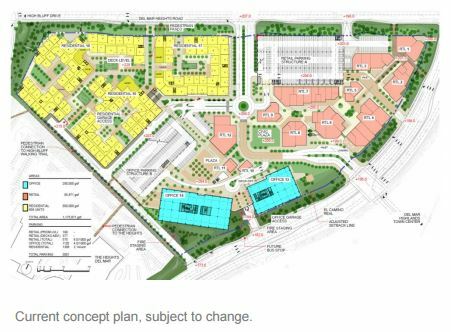 Design Option A includes a more private, enclosed residential area, a shopping center with two parking lots (on Del Mar Heights and on El Camino Real), and office buildings oriented with more space toward El Camino Real. Options B and C use a different residential layout, that is more open to the public and less linear along the street fronts. Options B and C also angle the office buildings "down in the middle", the opposite of Option A. This gives more public space in the middle of the project, but moves the offices closer to the street. Finally, Option B has a larger store in the retail section, along Del Mar Heights. This might be a market or some other large tennant. Options B and C have a single parking structure along Del Mar Heights, which is mostly underground (the top of the structure is even with the retail stores.) Option A has retail parking in multiple surface lots, with some underground parking beneath the retail. Some of the plans have retail areas that cross into the office section or into the residential section. However, none of the designs include residential in the main retail area, nor do they include retail in the offices. Remember, submit your comments before September 2, 2015! 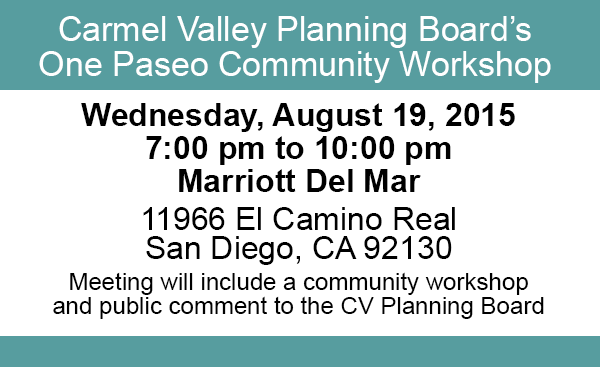 A special meeting of the Carmel Valley Community Planning Board has been scheduled for Wednesday, August 19, 2015 from 7:00 pm to 10:00 pm in the Grand Ballroom at the San Diego Marriott Del Mar located at 11966 El Camino Real, San Diego, CA 92130 for a board and community workshop and discussion of One Paseo, a mixed-use project planned on the corner of Del Mar Heights Road and El Camino Real. NOTE: Hotel parking will be validated for the meeting attendees. This is your opportunity to comment on a number of conceptual project layouts before the final arrangement is determined. If you attend this meeting, you will see a number of more specific plans AND have the opportunity to comment on the details, telling Kilroy what you like and dislike about each plan. The final project will be influenced by this community input, so here’s your chance to be heard! Many people assume that the project has already been finalized through some combination of a lawsuit settlement and a small group of citizens currently working with Kilroy to provide community input. This is not the case. The work so far has been to organize the issues, leading to a number of options that may be acceptable to the community. The Protect San Diego's Neighborhoods coalition is looking for you to attend the One Paseo Hearing, where the City Council will determine if they overturn their previous approval of the One Paseo development, or if they send the issue to the voters. For Carmel Valley, it would be best if the project was overturned right now, rather than having to wait another year for a decision. The hearing is being held on Monday, May 18 at 1 p.m. at Golden Hall, located at 202 C Street in Downtown San Diego (adjacent to the City Administration Building). The Coalition says, "Help us defeat THIS One Paseo once and for all by attending the hearing and wearing red (including your No on One Paseo t-shirt and button)!"